Sphagnum is the common name and genus name for a group of mosses (Division Bryophyta) whose leaf-like appendages are adapted to absorb and retain a great deal of water. Some species of Sphagnum can hold up to 20 times their dry weight in water. Sphagnum species are also commonly called peat moss, due to its prevalence as one of the major plant species in peat bogs. As mosses, they are non-vascular land plants. Peat moss is commonly sold as a soil structure enhancer or conditioner, or used in potting of plants. Sphagnum moss has also been used medicinally for centuries as a dressing for wounds. Sphagnum wetlands are a major resource of unique species. Peat formed from Sphagnum can be dried and burned and thus is used as a domestic or commercial energy source. In its natural setting, peat can help in flood mitigation, while longer term, peat is a early transition stage in the formation of coal. Anaerobic, acidic sphagnum bogs are known to preserve mammalian bodies extremely well for millennia. The common development practice of draining sphagnum wetlands for purposes of intense agricultural, residential, or commercial use has been underway for centuries and continues today, raising concerns for the loss of sources of this unique and valuable resource. Common sundew in a Sphagnum moss cushion. Sphagnum is a type of moss. Mosses are small, soft, non-vascular land plants placed in the Division Bryophyta. Mosses are typically one to ten centimeters tall (0.4 to four inches), although some species are much larger. They commonly grow close together in clumps or mats in damp or shady locations. They do not have flowers or seeds, and their simple leaves cover the thin wiry stems. At certain times, mosses produce spore capsules, which may appear as beak-like capsules borne aloft on thin stalks. Mosses can be distinguished from the apparently similar liverworts (Marchantiophyta or Hepaticae) by their multi-cellular rhizoids. Other differences are not universal for all mosses and all liverworts, but the presence of clearly differentiated "stem" and "leaves," the lack of deeply lobed or segmented leaves, and the absence of leaves arranged in three ranks, all point to the plant being a moss. In addition to lacking a vascular system, mosses have a gametophyte-dominant life cycle. In other words, the plant's cells are haploid for most of its life cycle. Sporophytes (i.e. the diploid body) are short-lived and dependent on the gametophyte. This is in contrast to the pattern exhibited by most "higher" plants and by most animals. In seed plants, for example, the haploid generation is represented by the pollen and the ovule, while the diploid generation is the familiar flowering plant. Members of the Sphagnum genus consist of a main stem, with tightly arranged clusters of branch fascicles, usually consisting of two or three spreading branches and two to four hanging branches. The top of the plant, or capitulum, has compact clusters of young branches. Along the stem are scattered leaves of various shape, named stem leaves; the shape varies according to species. The leaves consist of two kinds of cell: small, green, living cells (chlorophyllose cells), and large, clear, structural, dead cells (hyaline cells). The latter have the large water-holding capacity. Spores are released from specialized black, shiny capsules located at the tips of thin stalks. Sphagnum species also reproduce by fragmentation. Peat moss can be distinguished from other moss species by its unique branch clusters. The plant and stem color, the shape of the branch and stem leaves, and the shape of the green cells are all characteristics used to identify peat moss to species. Bogs are dependent on precipitation as their main source of water and nutrients, thus making them a favorable habitat for sphagnum as it can retain water quite well. Sphagnum species are common in bogs and fens, in swamps, and around ponds and lakes, often as dense clumps, or a floating mat, formed on open water. Peat mosses occur mainly in the Northern Hemisphere where different species dominate the top layer of peat bogs and moist tundra areas. The northernmost populations of peat moss lie in the archipelago of Svalbard, Arctic Norway at 81° N.
In the Southern Hemisphere, the largest peat moss areas are in New Zealand, Tasmania, southernmost Chile, and Argentina, but these southern peat moss areas contain comparatively few species. Many species are reported from mountainous, subtropical Brazil, but uncertainty exists regarding the specific status of many of them. Peat moss can be used as a soil additive, which increases the soil's capacity to hold water. This is often necessary when dealing with very sandy soil, or plants that need an increased moisture content to flourish. One such group of plants are the carnivorous plants, often found in wetlands (bogs for example). Peat moss is also a critical element for growing mushrooms; mycelium grows in compost with a layer of peat moss on top, through which the mushrooms come out, a process called pinning. Sphagnum also can be used to add acidity to the soil. Peat moss can acidify its surroundings by taking up cations such as calcium and magnesium and releasing hydrogen ions. Sphagnum is not good as a mulch (protective cover placed over the soil) because when dry it can repel water from entering the soil. Sphagnum moss has also been used for centuries as a dressing for wounds. It is absorptive and extremely acidic, inhibiting the growth of bacteria and fungi. However, Sphagnum moss can potentially harbor the chronic fungal disease, sporotrichosis. Sporothrix schenckii spores enter the skin via abrasions, scratches, and small puncture wounds as a result of unprotected contact exposure to Sphagnum moss. In New Zealand, both the species Sphagnum cristatum and Sphagnum subnitens are harvested by hand and exported worldwide for use as hanging basket liners, as a growing medium for young orchids, and mixed in with other potting mixes to enhance their moisture retaining capacity. Sphagnum wetlands are a major resource of unique species. Dried Sphagnum moss is also used in northern Arctic regions as an insulating material. Peat moss is also used at horse stables as a bedding in horse stalls. It is not a very common bedding, but some farm owners choose peat moss to compost with horse manure. 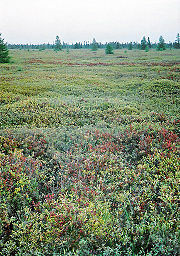 Large sphagnum bog near Ottawa, Ontario, Canada. Peat moss is used to dispose of the clarified liquid output (effluent) from septic tanks in areas that lack the proper soil to support an ordinary disposal means or for soils that were ruined by previous improper maintenance of existing systems. Peat moss also can be used as a substrate for tarantulas as it is easy to burrow into and contains no insecticides that could kill the spider. Anaerobic acidic Sphagnum bogs are known to preserve mammalian bodies extremely well for millennia. Examples of these preserved specimens are Tollund Man, Haraldskær Woman, Clonycavan Man, and Lindow Man. Such Sphagnum bogs can also preserve human hair and clothing, one of the most noteworthy examples being Egtved Girl, Denmark. Sphagnum plants can be a major component in peat formation. Peat, a dark, fibrous accumulation of partially decomposed and disintegrated organic matter found in wet areas, usually comprises residues of plants such as mosses. Peat formed from decayed, compacted Sphagnum moss may sometimes be labeled as sphagnum peat. However, peat can form from a wide variety of plants, as well as include partially decayed organic matter of animals. Sphagnum and the peat formed from it do not decay readily because of the phenolic compounds embedded in the moss's cell walls. Peat can be dried and burned and thus is used as an energy source, such as home heating or even for power stations. In its natural setting, it can help in flood mitigation. Longer term, peat is a early transition stage in the formation of coal. It should be noted that there is a difference in naming conventions for similar things related to sphagnum moss. 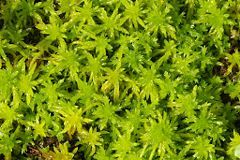 The terms that people use when referring to moss peat, peat moss, sphagnum peat, and bog moss can be taken out of context and used when reference is actually being made about a plant that is still growing, as opposed to the decayed and compressed plant material. These terms are commonly used for both forms of the same plant material—still growing and decayed—resulting in confusion as to what the speaker is actually talking about. Technically, Sphagnum species are the living mosses. Sphagnum peat is a partially decomposed accumulation of organic matter largely made up of Sphagnum species. The term peat moss commonly is used in both the sense of the living species and the partially decomposed peat. Large-scale peat harvesting is not sustainable. It takes thousands of years to form the peat "bricks" that are harvested in just a week. In particular, the extraction of large quantities of moss is a threat to raised bogs (IPCC 2002). In New Zealand, care is taken during the harvesting of sphagnum moss (peat from sphagnum moss, not to be confused with the more general term moss peat) to ensure that there is enough moss remaining to allow regrowth. This is commonly done using a three year cycle. If a good percentage of moss is not left for regrowth, the time that it takes for the swamp to revert to its original state can be up to a decade or more if serious damage has occurred. This "farming" as done in New Zealand is based on a sustainable management program approved by New Zealand's Department of Conservation. This plan ensures the regeneration of the moss, while protecting the wildlife and the environment. Most harvesting in New Zealand swamps is done only using pitchforks without the use of heavy machinery. During transportation, helicopters are commonly employed to transfer the newly harvested moss from the swamp to the nearest road. This is an important component of the transportation process, as it prevents damage to other components of the ecosystem during the initial transportation phase. The removal of sphagnum moss in a managed environment does not cause a swamp to dry out. In fact, the swamp environment is improved such that the regrown moss is normally better quality than the original moss that was removed. The greatest threat to the existence of sphagnum moss swamps is the intentional draining for encroaching farmland. Eddy, A. 1988. A Handbook of Malesian Mosses. Volume 1. Sphagnales to Dicranales. British Museum (Natural History). ISBN 0565010387. Irish Peatland Conservation Council (IPCC). 2002. Action 11. Moss peat & horticulture Irish Peatland Conservation Council. Retrieved May 4, 2008. United States Department of Agriculture (USDA), Natural Resources Conservation Service (NRCS). n.d. Classification for kingdom Plantae down to genus Sphagnum L United States Department of Agriculture. Retrieved May 4, 2008. This page was last modified on 20 August 2008, at 22:24.